"This story had me sucked in on page one and kept me up until 4a.m. reading. I guarantee once you pick up this book you will not want to put it down!" "...continues on with the fabulous, descriptive writing style readers have come to enjoy through Brenda's Talisman series. Readers will easily dive into this story!" 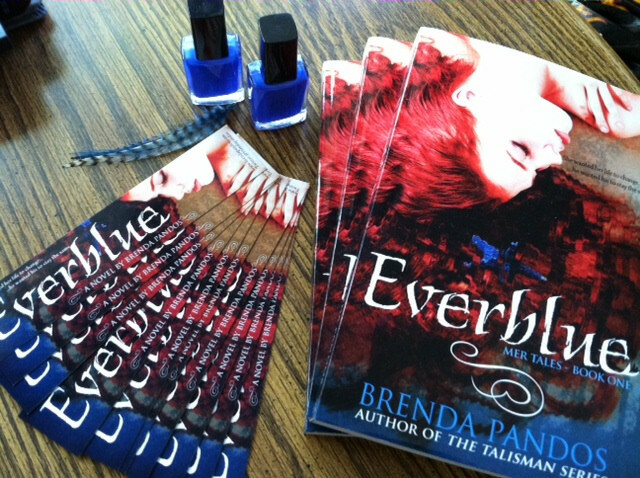 "With Everblue , Brenda Pandos presents wonderfully imaginative world building, well rounded character development and a perfect timing for establishing conflict, which all helps to create a treasure of a tale that proves her talent and will do much to further establish her footing in this highly competitive industry." "Recently there have been quite a few mermaid themed YA books released, but Everblue tops the charts! The story was absolutely captivating!" "... this is not your typical mermaid story, especially seeing as the mermaid it is about isn't a mermaid at all. He is a merman. I have never read a book written from the point-of-view of a merman and it was very refreshing. Seeing the underwater life through the eyes of a guy is not something I thought I would enjoy but it was really interesting." "Everblue is not my first mermaid book that I've read. Everblue is the first Mermaid story I loved though." 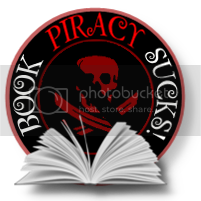 "I have heard about Mermaid/Mer people books in the blogosphere but hadn't read one ever... I wasn't sure what to expect but Everblue definitely surprised me positively." Week one of the tour has commenced and it's been a nail bitter for me. The desires for each book are the same: a page-turner, something (mostly) original, adoration for the characters, a believable story. It's the fun and hard part of writing and a bit of an emotional roller-coaster. I know my story won't resonate with everyone, but when it comes down to it, I like writing and want to provide something people like to read, plain and simple. Whew... glad I got that off my chest. "I knew going into this that I’d probably like it, as Pandos has shown that she’s got the ability to craft a really good story. And this one, wow. Even better than I’d expected. " "I love this book. It's a sweet escape with lovable characters, especially the adorable Fin. " "Overall, I very much enjoyed Everblue. Brenda is awesome at weaving a story together and making you feel like you're there with the characters. 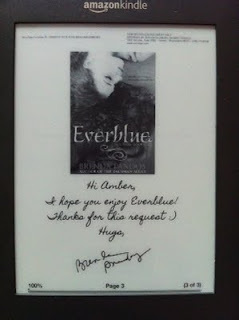 And while I might not have liked all the characters or elements in Everblue, I felt engaged as a reader and really, that's more important to me." "...an excellent choice for many teens as the struggles the kids go through are pretty similar to what they may be going through. That time of life is one where things you believe are true change as you comprehend how the world really works. It's kind of funny that fantasy is a place to work it out but maybe it is exactly the fantastic aspect that allows kids the room to do so without their own world being threatened." Eleni, my friend since the beginning of my writing career and fabulous supporter of my work, touched my heart with her review. Thank you for hosting!! "The dual narrative that was going on between Ashlyn and Fin created a great balance for both stories. It helped me connect with the human side of things, while also losing myself in the fantastical sea world. Overall, it was a delightful mer tale that will leave you wanting the sequel! " "I just adored this book. I loved the creativeness of the world, how it's told from duel viewpoints, the romance, the friendships, I just loved it all. Being able to be inside Fin and Ash's head and follow each of their stories was just brilliantly done." And she was the first to comment on the fin at the end of the E of Everblue. Extra cookies for her! Thank you, ladies for your insight and reflections! I'm so honored you'd take the time to comment on my latest story! I'm borrowing this idea from my good friend and author Kristie Cook. First, I'm super excited to be able to sign Kindle copies now at kindlegraph.com and would love to see where else my babies have found homes. I also hope everyone enjoyed the twitter party on August 6th. I'm especially grateful to Jaime from twochicksonbooks. I've mailed all the goodies out, so if you were a winner, be looking for those! I give Brenda Pandos permission to use this to promote her work. I'm excited! Trivia questions are ready to go for the book release party tonight. Prizes will be e-books, swag packs, cool blue nail polish, a pretty feather for your hair and signed BOOKS. 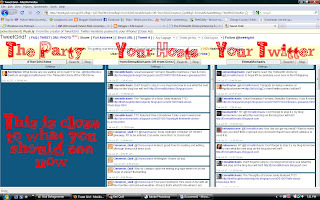 If you've never done a twitter party before, don't worry--it's easy. 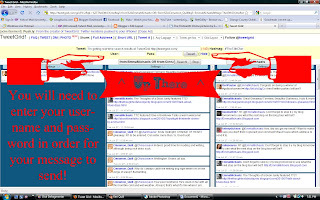 Here's instructions: Joining a twitter party. Did I mention I'm excited? Hope to see you there! You're invited to my Everblue Release Twitter Party Saturday, August 6th. 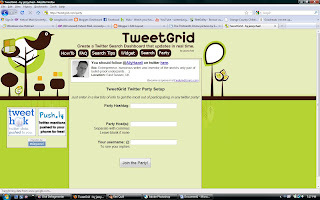 If you never been to a party before, check out this post how to use Tweetgrid to follow along. Books, bookmarks, Kindle/Nook e-copies too! And also look forward to the blog tour coming up August 15th. There will be giveaways of the book every Friday and v-blogs from me answering questions from bloggers! I'm excited! You can get your copies here Kindle , paperback copies on Amazon , and Nook. Never been to a twitter party? It's easy! Step 2: You should see this page. What you see is the party on the left, hosts in the middle, your tweets on the right. Then you are ready to PARTYYYYY! :) There will be fun trivia, prizes and cyber food! Hope to see you there!!!! Here's my crazy v-blog to celebrate the fun day (love my expression). I hope you enjoy. The paperbacks on Amazon aren't quite up, but there's a sign-up to be notified here. Also, you can get signed copies for $8.99 (regular $11.99) this week here. And there's Kindle and Nook too! This day wouldn't have happened with all the support from my friends and family in my life. Thank you! Saturday at 6:00pm PST I'll be hosting a twitter party #Everblue. There will be trivia, games, prizes and giveaways. Don't miss out! Everyone will have an opportunity to win!